5:53 pm - Speed Racer, the new film directed by the Wachowski Brothers, had its world premiere this past Saturday at the Tribeca Film Festival. 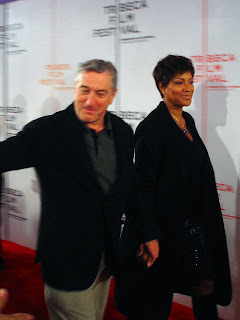 Among the stars arriving via the red carpet were Robert De Niro, co-founder of the festival, and Limp Bizkit front man Fred Durst. Also in attendance were the film's producer, Joel Silver, and most of the cast, including Christina Ricci (Trixie), Susan Sarandon (Mom), Christian Oliver (Snake Oiler), and Paulie Litt (Spritle). 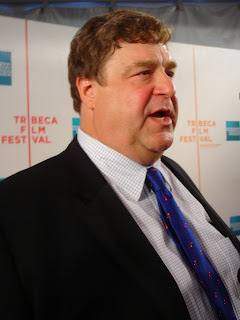 Also there, John Goodman, who plays Speed's dad, Pops, and is a fan of the original show, said "[The cartoon] was different from anything that was on before." When asked if he would appear in the Wachowskis' next film, he responded, "They're great. Andy gives me all kinds of great fiction to read. We're kind of tuned into the same stuff. I hope so." Peter Fernandez voiced Speed Racer on the American version of the Japanese import, but now plays a race announcer in the new summer movie. 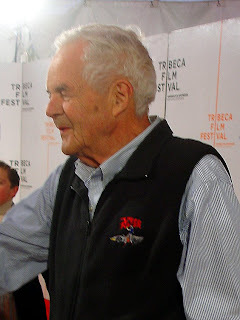 Primarily a voice actor, he hadn't appeared in front of the camera in some time, joking, "I make a feature film every 60 years." Kick Gurry, who plays Sparky, Speed's mechanic, spoke of the difficulty with working on a film with no actual props. "John [Goodman's] character has to design the cars, and I have to fix them. We'd always laugh, because we actually had absolutely no idea what the hell the cars were made of, or what they were doing. In fact, most of the time, there wasn't even a car sitting there. It was all computer generated." Lead actor Emile Hirsch, echoed the sentiment, "You really have to put your imagination to work." 8:34 pm - In the movie, Speed Racer, potentially the greatest auto racer of all time, refuses to break the records set by his late brother and idol, Rex. Sought by industrialist Royalton (played with evil relish by Roger Allam) to join his race team, he refuses to betray his father, who wisely sees the depth of Royalton's corruption. But when that leads to Speed being blacklisted in the racing community, he must join the masked Racer X (Matthew Fox) to bring the villainous businessman down. 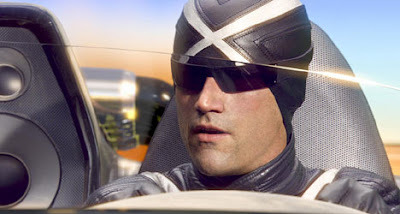 Fox deepens his voice a notch to play the mysterious Racer X. X is much more charismatic than his more famous role, the tiresome Jack in the TV hit, Lost. Clever, agile, and clad in a cool suit of black leather, I'd be very surprised if Racer X doesn't get his own movie spin-off, as he is arguably more popular than Speed. Exciting and fast-paced, Speed Racer can be hard to keep up with if you're not tuned in. Approaching the film as if it were animated, the Wachowski's take advantage of the flexibility the medium affords in telling a story. They use wipes to transition from shot to shot rather than cuts. Foreground and background are always in focus simultaneously, as in most animated fare. Awash in brilliant colors and effects meant to duplicate some of the conventions of Japanese anime, it might lose some older folks, but kids and the young at heart should have no problem keeping up. 11:17pm - Took the train up to the Village with my friend, J.C. Alvarez, to get dinner at the Waverly Inn and Garden (16 Bank St., New York, NY, 10014, 212-243-7900). The Waverly is a bustling, hip restaurant owned by Graydon Carter, editor of Vanity Fair. There's always a few celebrity sightings, and this night was no different. Sitting in the back of the restaurant when we arrived was Ron Perlman of Hellboy fame, and Miami Steve of the E Street Band, aka Silvio Dante of The Sopranos, Steven Van Zandt. And the food? It was delicious, I started off with a Tuna Tartare, with avocado and dijon emulsion, that was perfect both in taste and presentation. That was followed with the Brook Trout on Cedar plank with roasted carrots, which were appropriately toasty and savory. For dessert, an awesome warm Bananas Foster served with a scoop of ice cream. J.C. enjoyed the Amish Free-Range chicken followed by a warm apple crisp, also served with ice cream. The service was excellent, as we were well taken care of by five different waiters on a crowded Saturday night, with no one dropping the ball even once. 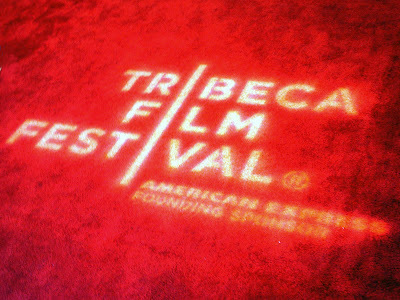 This was the perfect way to end my time at Tribeca, before heading home to Miami the next day. A slightly modified version of this entry first appeared on Blogcritics on 5/5/2008. Still provided courtesy of Warner Bros. Pictures.